You can now create, browse and purchase items from Gliph Marketplace using your laptop or desktop computer. You can take photos and start your listing using the Gliph app for iPhone or Android then finish editing the draft and publish it from your PC. 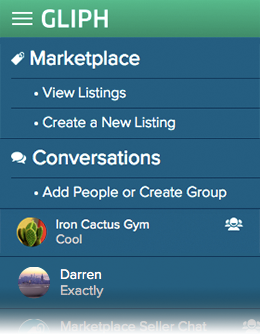 When someone has responded to your listing, you can chat with them using the desktop web app. This means you can easily handle the sale of your items whether you’re sitting in front of your computer or on the go. The same goes with buying from Gliph Marketplace. You can browse listings, start interacting with a seller and even complete payment in just a few steps all from the new Gliph desktop web app.